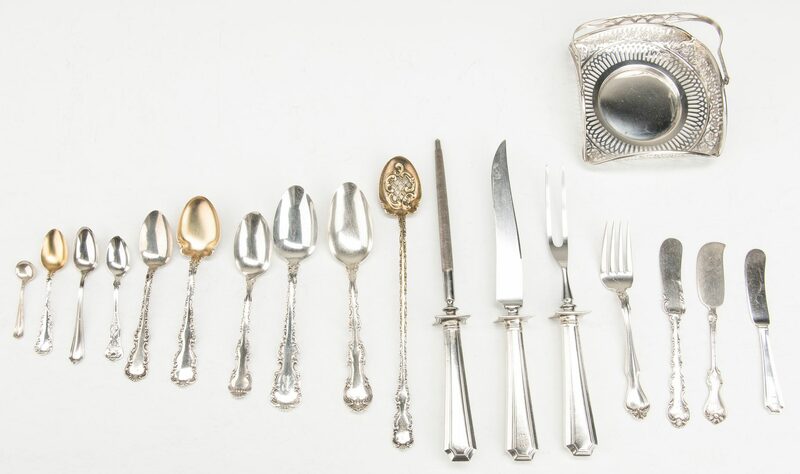 62 items assorted sterling silver flatware plus one swing handle candy dish. 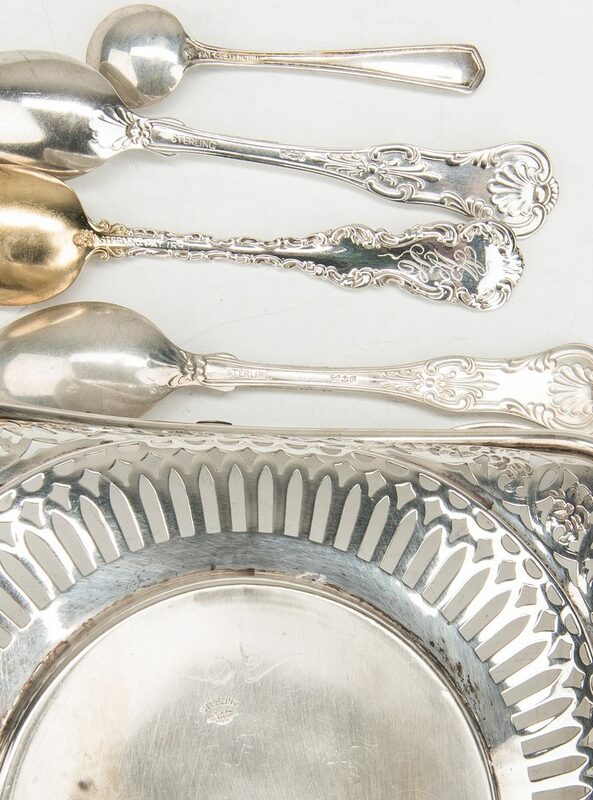 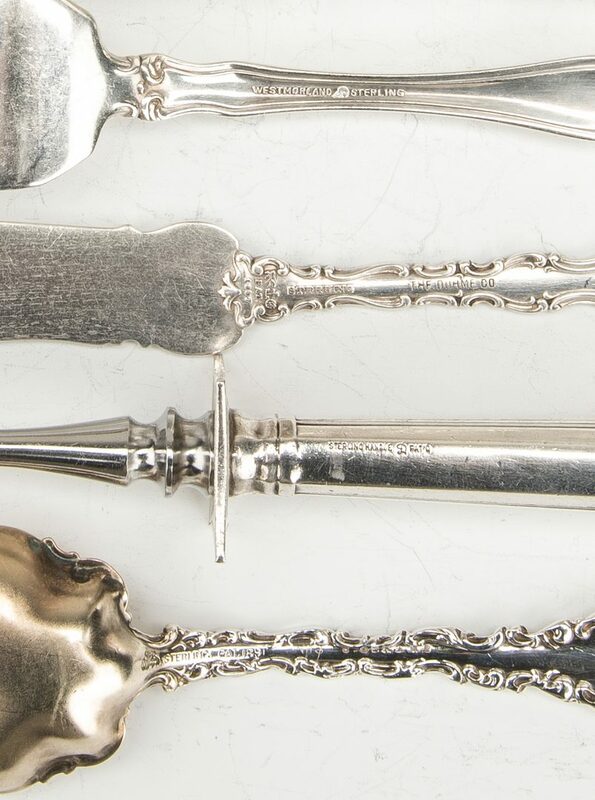 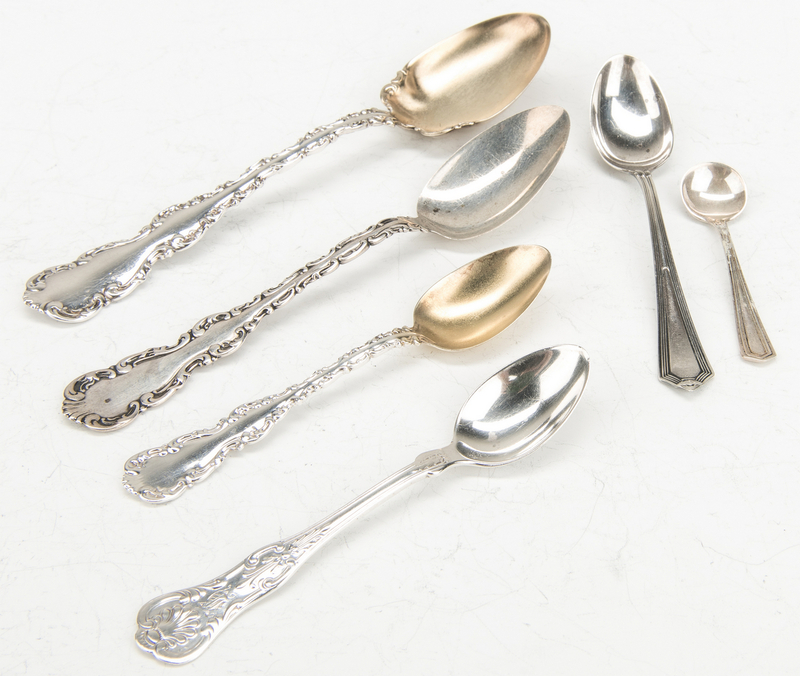 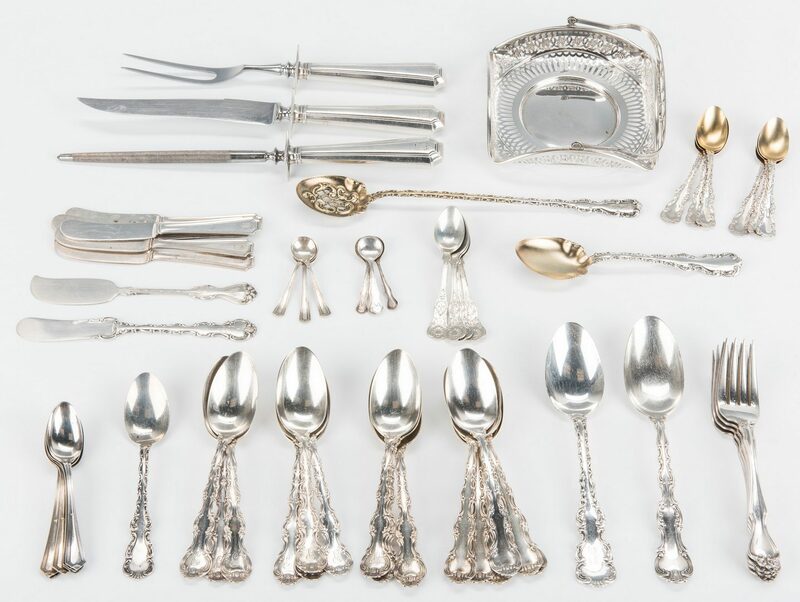 1st group: 29 pieces sterling flatware including Gorham Strasbourg pattern: 17 teaspoons, 1 place spoon and 1 flat butter spreader, all with Lion, Anchor, G marks; and 10 vintage Whiting Louis XV pattern: 6 demitasse spoons with gilt bowls, 1 sugar spoon with gilt bowl, 1 place spoon, 1 five o'clock spoon, and 1 pierced long spoon with gilt bowl. 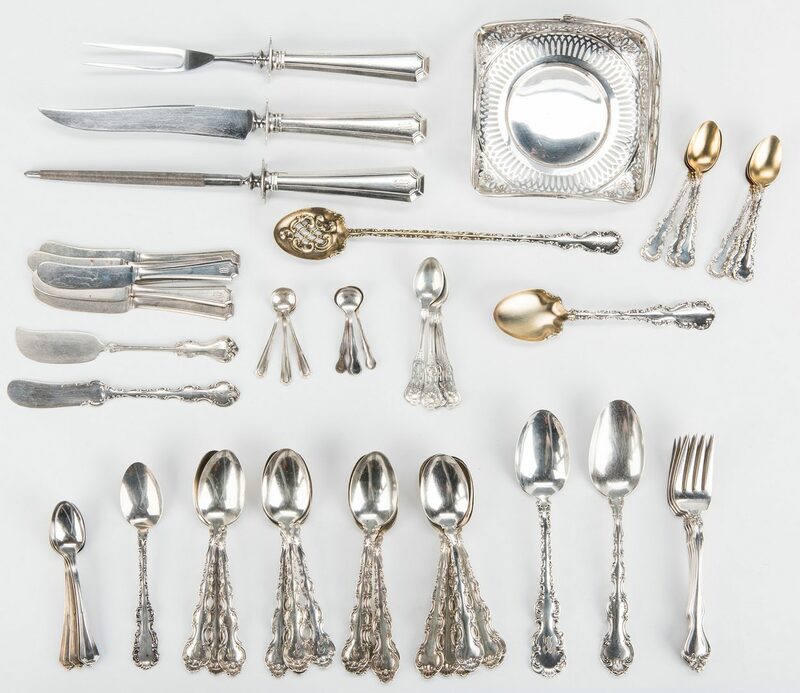 2nd group: 29 pieces assorted sterling flatware including 4 Westmoreland George & Martha Washington pattern salad forks, 6 Durgin Fairfax pattern flat butter spreaders, 1 Whiting Duke of York pattern flat butter spreader, 4 Gorham Plymouth pattern and 6 Kings III pattern demitasse spoons and 8 assorted salt spoons. 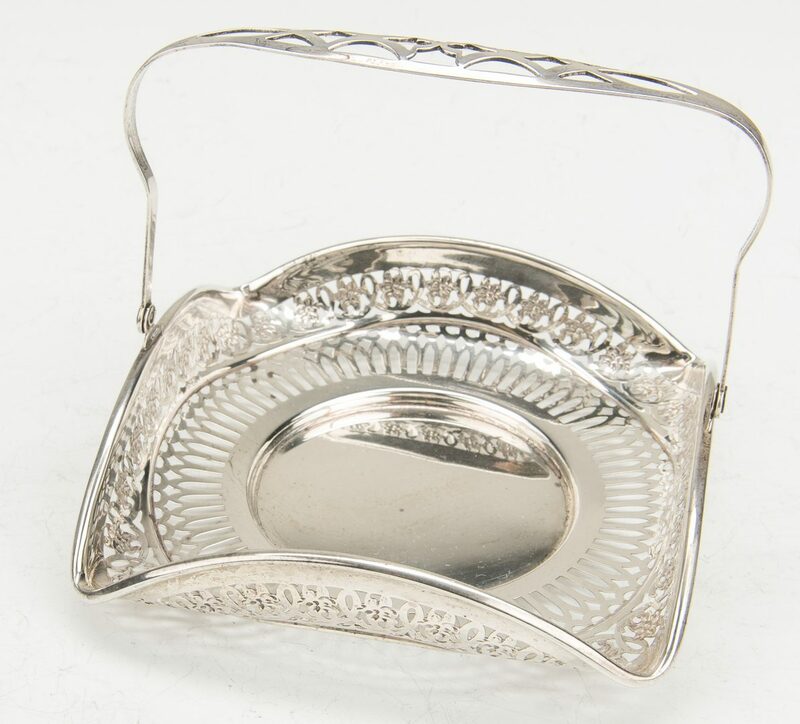 59th item: One Webster sterling silver square candy dish with pierced rim and swing handle, 4-5/8" sq., 2.585 oz troy. 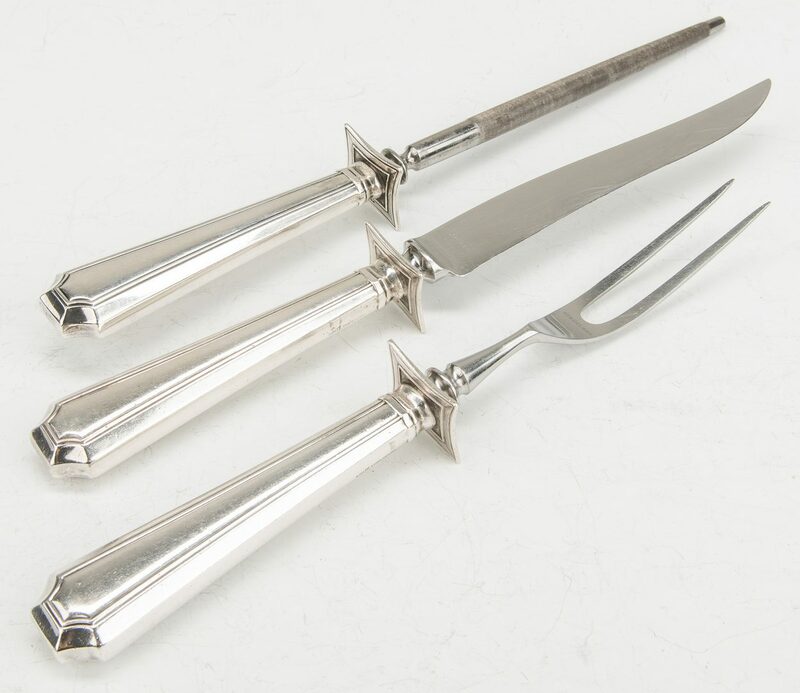 60th-62nd items: Three-piece Durgin Fairfax pattern carving set with sterling weighted handles and stainless tops. 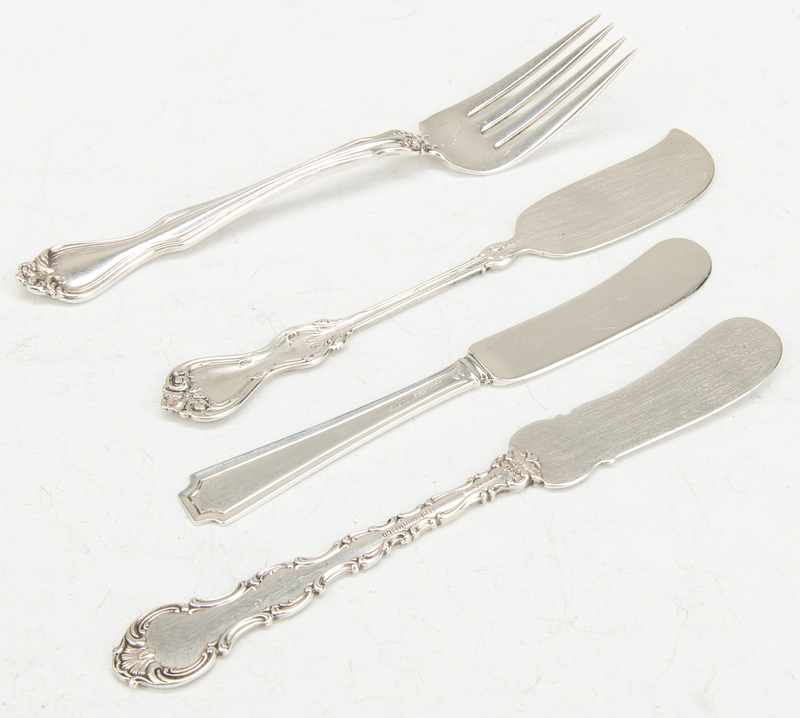 All flatware – 2-1/4" to 10-1/4", 29.855 weighable oz troy/flatware. 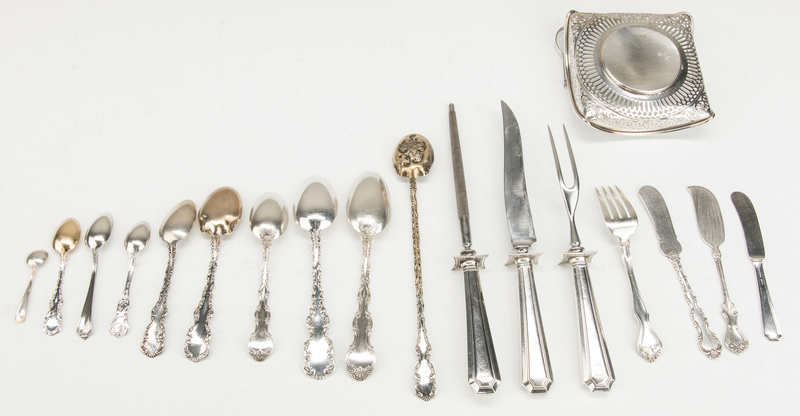 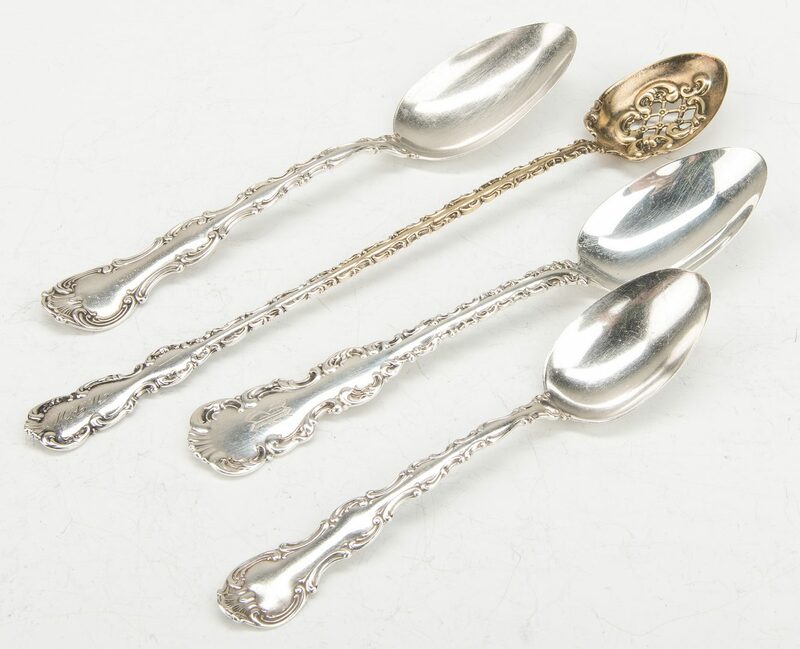 Total weighable oz troy: 32.44 oz t. CONDITION: Most flatware with single monogram. All with some surface wear due to age and use. 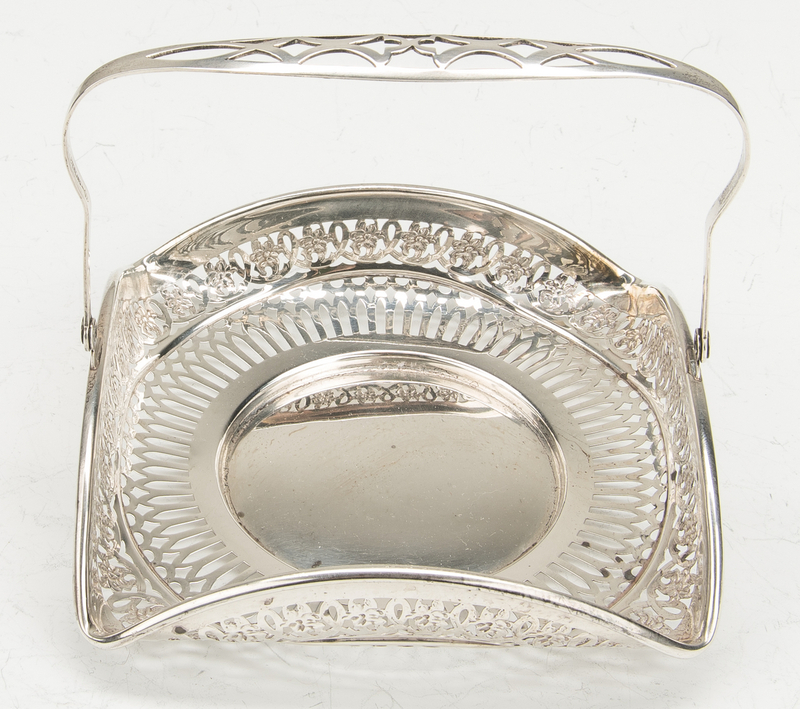 Candy basket in good condition and not monogrammed.